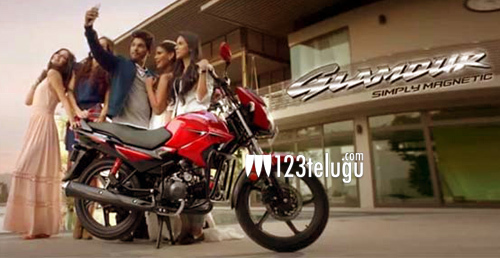 Stylish star Allu Arjun has been roped in by Hero Motocorp Ltd to endorse its 125c.c Glamour motorcycle. Allu Arjun forayed into the commercial ad business by endorsing ‘7up’ drink couple of years ago and after that he was seen as a brand ambassador for a bunch of brands. The Hero Motocorp company in a statement said Allu Arjun’s persona resonates well with Hero Glamour’s brand proposition – powerful, stylish and magnetic. Allu Arjun is currently busy in wrapping up the shooting of his latest project ‘S/O Satyamurthy’ directed by Trivikram and after this he will act in a film directed by Boyapathi Srinu.